OK, so we already discussed some basic practice techniques in a previous article. Great advice about keeping your ukulele tuned, setting aside time to practice, playing slowly at first, using a metronome, and playing along to songs you like. After a few weeks and months of this we start to advance, but instead of a peak we find a plateau! Often when folks pick up a musical instrument, they try it for awhile and then get frustrated and slowly practice less and less. Trust me, I give music lessons, and it’s quite common for folks to peter out in the beginning. However, there are those dedicated few who keep with it, they follow the beginner advice and they practice, but then they get to a point where they have trouble moving further up. While a plateau is common with every skill, I’m going to give you a few pointers on how to keep rising as a ukulele player. Practice is meant to be a quiet time, turn it into a ritual. Always have all supplies and necessities nearby. Not just tuners and chord dictionaries, but a glass of ice water, coffee, and anything else you might need. During your hour or so of practice do not get up, save for an emergency. For those of us with kids this is not easy, but find a way to make it happen. Just like exercise, warm up before practice. Stretch, breathe, and sit up straight while playing. Have a goal in mind for each practice. Maybe on Monday work on a specific mode or scale in a certain key. On Tuesday play that same scale using your left hand ring and pinky fingers to change it up and physically challenge your hand. On Wednesday find new and advanced chords that fit in that mode and scale. Take a break Thursday and just read some ukulele oriented blogs (like this one!). On Friday and Saturday find specific songs that fit your mode and chords you have been working on and review the week’s practice. Any structure you can find to practice is good. Build off what you learned the day before, review often, and don’t forget your muscles do need rest. Work on making practice time an essential part of your day. We live in an era were we all think we have no time to do anything. But I promise you spend enough time on your phone, Facebook, Snapchat, or whatever social media you are on that you could be practicing ukulele. Think about it, in the end you will get far more satisfaction on the Ukulele than you will with all the other humdrum of time wasting! My job relies on creativity and so I keep notebooks around the house to write in, they especially come in handy for ukulele practice. While watching the awesome 80’s Australian film Young Einstein, I realized how great the music in that movie was. Especially the song by Paul Kelly “Dumb Things.” After the movie I picked up a ukulele that was sitting in the living room and attempted to play this song on my tenor, it wasn’t easy switching from Am to Em, but with practice the song turned out to be an awesome piece for the ukulele. You never know when a song is going to come up that will be perfect for the ukulele, and I promise if you don’t write it down you WILL NOT remember it. After your movie or TV show is over, or while the radio is playing, if you hear a song you like pick up the ukulele and try it out, if it initially sounds good… save it for the next practice! You never know when inspiration will strike, be ready. The BEST way to learn an instrument is to learn how to write music on it. Even if you don’t fancy yourself a songwriter, practice writing tunes. By writing your own tunes you force yourself to deal with music theory, with new chords, scales, melodies, and harmonies. Perhaps you enjoy playing certain cover songs, if so create your own solos. Find the key of the song you like and figure out a solo that sounds great. If you have trouble writing songs at first, try changing the lyrics to songs you know. Once you are comfortable, start changing the chord progressions completely and making whole new songs. And don’t forget to write down all your compositions in a notebook and record them if possible. They will not be perfect at first, but as your ukulele playing and musical understanding grow you can enhance and expand your compositions. Giving lessons to other players is a phenomenal way to become a better ukulele player. Now depending on your level of playing, you may not feel comfortable charging other people money, and you shouldn’t if you do not have a few years under your belt. However, every chance you get show others how to play. If you have a guest over who is amazed at your uke playing, hand them the instrument and show them a few chords. Short lessons, long lessons, kids, adults, anytime you have a chance, share your knowledge of the ukulele. Any teacher will tell you that they don’t know everything about their subject, teaching is how you grow and cement your own skills. Once you can confidently show another person how to play the ukulele, you are on your way to becoming an intermediate and advanced player. It seems simple, but we need to follow our practice and ukulele playing with positive reinforcement. Clearly you will be practicing often so at the end you shouldn’t be always eating sweets or indulging in a drink, but you need to find some way to reward yourself afterwards. Perhaps some relaxing TV shows, some music, or whatever it is you feel you have earned. Personally when I am done practicing I like to kickback and play my absurd original songs and odd covers on the ukulele. The key is to help your brain automate good habits, let it know that practice is important and will always be compensated for a job well done! At the end of the day, your ukulele skill is all up to you. As I tell my students; I can only teach you so many scales, chords, theory, techniques, and songs. 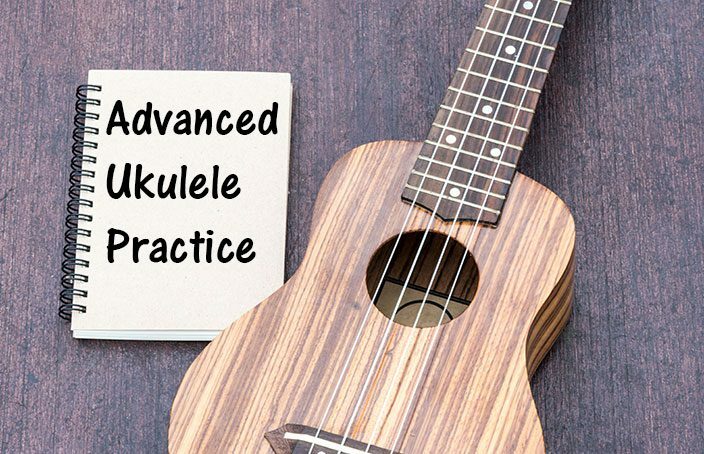 It is up to each ukulele player to put forth a daily effort and practice at being the best they can be!